A man who calls himself P.J. (played by Howard Nash), has witnessed a horrific accident and subsequently retreats within himself. He barely talks, and doesn't even know who he is. 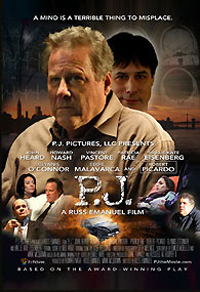 He is brought to a hospital where the resident doctor (John Heard) tries to get through to him with the help of his assistant (Vincent Pastore) and P.J. 's bitter ex-girlfriend (Patricia Rae). All the while, the doctor is fighting his own life's demons, and an out-of-touch supervisor (Robert Picardo) who wants P.J. permanently committed. Relevant questions of God and faith are tackled in this dramatic, yet inspiring film based on Mark McQuown's award-winning play.